Chicago’s first "L"—today’s South Side Green Line—began operating between Congress and 39th Street (Pershing Road) on June 6, 1892. By the next May, service had been extended to the Columbian Exposition fairgrounds at 63rd and Stony Island. Business on the "L" boomed. But once the fair closed, ridership shrank. The original company went bankrupt and was reorganized as the South Side Elevated Railroad. This new company later built an Englewood line and short feeder branches to Normal Park, Kenwood and the Stock Yards. Meanwhile, political kingpin Mike McDonald launched the Lake Street Elevated Railroad in 1893. Unlike most of the other lines, McDonald’s "L" ran directly over city streets. The original route went from Market (Wacker) to Homan, with later extensions stretching the line to Harlem Avenue. 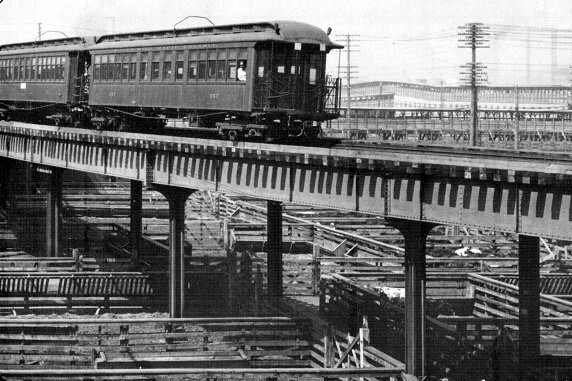 The Metropolitan West Side Elevated Railroad opened in 1895. The Met&apos;s downtown terminus was at Franklin near Quincy, and within a few years it expanded rapidly through the West Side. The Garfield Park main line eventually reached Forest Park. There were also branches to Logan Square, Humboldt Park, and Douglas Park. 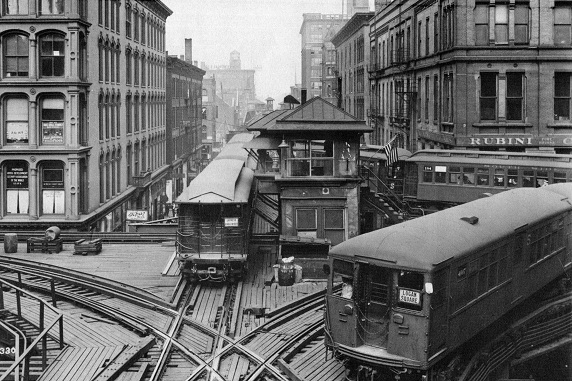 The earliest "L" trains were powered by steam locomotives. The South Side line converted to electricity in 1898. The other companies soon followed. These first three "L" companies all had stub terminals on the fringe of downtown. Many people talked about building a common “Union Loop” to link the various lines. Enter Charles Tyson Yerkes. Yerkes has an unsavory reputation—say “robber baron” to a historian, and the historian will often respond “Yerkes.” Still, Yerkes got things done. In 1897 he completed the Loop over Lake, Wabash, Van Buren, and Wells. 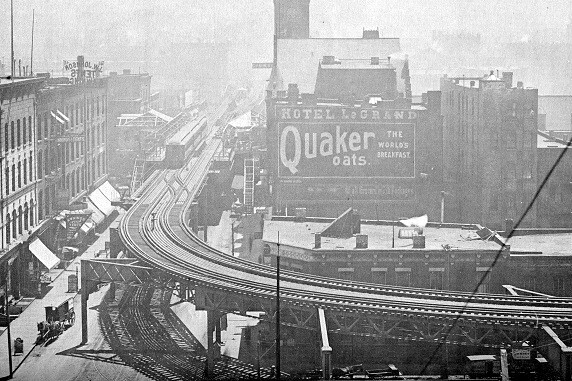 All three "L" companies started using the Yerkes track, though patrons still had to pay another full fare when they changed lines--a free transfer system was not adopted until many years later. 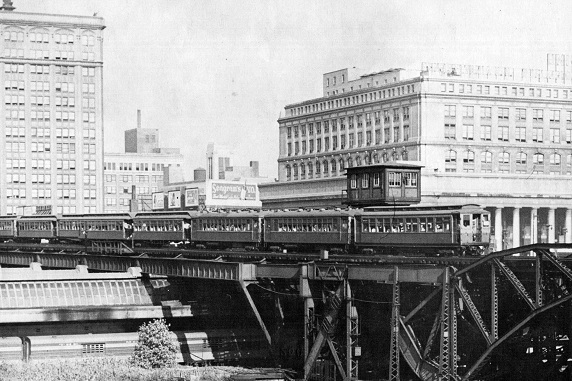 In 1900 a fourth company – the Northwestern Elevated – began operating from the Loop to Wilson Avenue. 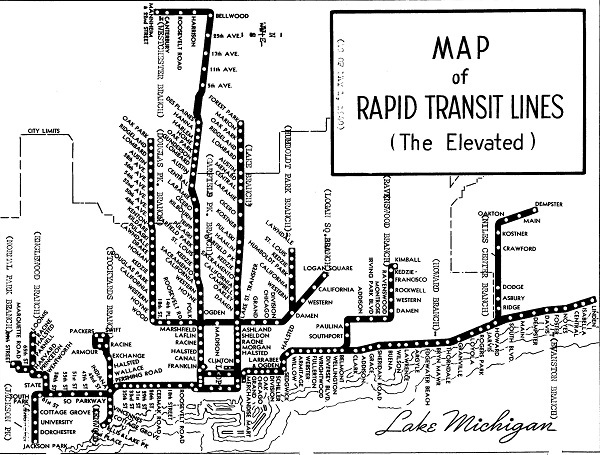 The main line was later extended to Howard Street, and a Ravenswood branch was built. There was also a line through Evanston to a terminal just over the Wilmette border. Then the Depression hit. Revenue fell off and service became shoddy. CRT was placed in receivership. Many Chicagoans believed it was time for government to take over the city&apos;s mass transit system.